The following clasp knife sold on Ebay on 19 Feb 2009. I have no reason to doubt the description. If it is correct, it is a wonderful little piece of history. 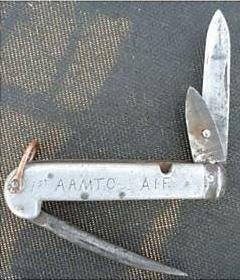 This knife complies with the specification for the Pattern 1904/1917 Clasp Knife, it also fits the description of the clasp knife issued to members of the Australian Imperial Force which was described as "Knife, clasp, with marline spike, tin opener" (see The Recruits Companion).